The “NFPA 70E, Standard for Electrical Safety in the Workplace” was first published in 1979 and has been refined and expanded in subsequent years, most notably for its recommendations on Arc Flash Hazards Analysis. NFPA 70E is now recognized by the Occupational Safety and Health Administration as the standard for electrical safety in the workplace. 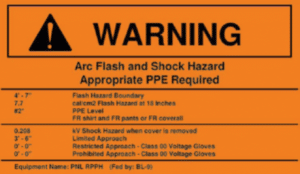 While NFPA 70E and the National Electric Code do not require an Arc Flash Analysis for compliance, it is highly recommended that one be completed in order to provide accurate labeling of your electrical equipment. Trumbo Electric’s Engineers are well versed in the requirements of NFPA 70E and can customize services to meet your facilities needs. An Arc Flash is a short circuit through the air, occurring when insulation and/or isolation between electrified conductors is lost. Arc Flashes most commonly occur during work on energized equipment when an employee moves near or comes in contact with equipment causing equipment failure, a phase-to-ground, or phase-to-phase fault. What are the dangers of an Arc Flash? Along with a blinding flash and deafening noise, Arc Flashes can reach temperatures upwards of 35,000° F, effectively vaporizing most metals and electrical components. 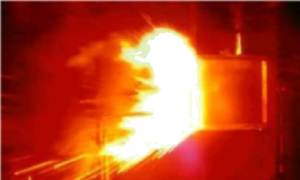 This explosion, capable of producing deafening pressure waves, can also expel molten projectiles at very high speeds. Can Arc Flashes be prevented? Not completely; any time work is performed on energized equipment, the potential for an arc flash exists. 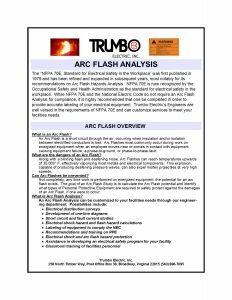 The goal of an Arc Flash Study is to calculate the Arc Flash potential and identify what types of Personal Protective Equipment are required to safely protect against the damages of an Arc Flash, if one were to occur.